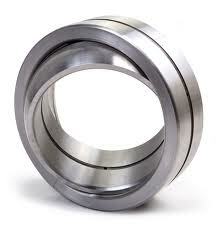 Additional designs include high misalignment, angular contact and extended inner rings. Spherical plain bearings, or commonly known as bushings, consist of a spherically ground inner ring (ball) and outer ring. Depending on the size of the part the outer ring is intentionally cracked to accommodate assembly. Our spherical plain bearings consist of races made of GRC15/52100 steel and are heat treated for optimum wear resistance. The races are phosphate coated for corrosion resistance and the sliding surfaces are MoS2 coated (not applicable to self-lubricating bearings). Bushings (also referred to as plain bearings, plane bearings, or sleeve bearings) operate with sliding motion between the moving surfaces. Bushings are selected based on the velocity and the applied load. 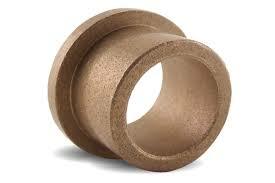 Maintenance-free bushings do not require additional lubrication to operate. Suitable for dry running, low coefficient of friction, lower wear, good sliding characteristics, forming a transfer film can protect the mating metal surface, suitable for rotary and oscillating movement. High chemical resistance, low absorption of water and swelling. Oil or grease lubricated bushes. Carbon Steel shell with sintered bronze lining. Various metric and imperial sizes available from stock. 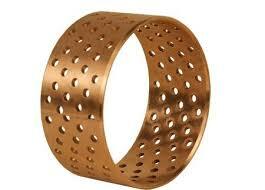 Used for Heavy Industrial Load applications.